Part of what makes our job interesting is working in close proximity to wild animals. Raccoons and squirrels are one thing, but getting in close quarters with a full grown osprey on the peak of a 250 foot tower is an exhilarating experience. We often get called out to solve such conflicts on telecom towers. We offer a wide range of commercial bird control services. Obviously we have all the necessary training, certifications, expertise and equipment to do this safely and efficiently. 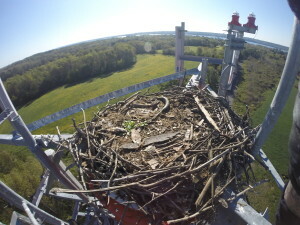 In this case osprey nested on a telecom tower and as a result posed a threat to repair crews that serviced the tower. We came in to make sure that no bird or person was hurt or in danger. This job was done during winter months when there are no eggs or hatchlings. We do come across nests during spring and summer time as well. In the one bellow you can also see half eaten fish in the nest. Osprey Nest on telecom tower. You can find out more information about osprey here.